Dusenflo gravity filter provides filtered water for all types of water conditions by using a homegeneous media. 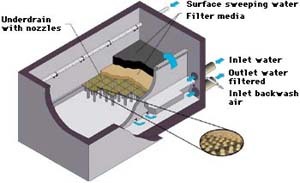 N/Ang a homogeneous media (normally sand or with a mixed bed media such as sand, anthracite, or activated carbon) allows the Dusenflo gravity filter to provide filtered water for all types of water conditions. Water percolates down through the media at flow rates up to 30 m/h. Backwashing with air and water delivers clean filter media between cycles. When used with the company's clarifier, the filter provides a compact water treatment system that provides consistent crystal clear water. A choice of media and underdrain nozzles is available.